Using nails and wood, fabric and paint, hardware and rigging, you create an illusion. You build the make-believe world of the play. Now you have a scene-shop manual to help you. In The Stagecraft Handbook, Daniel A. Ionazzi, director of production for the UCLA Department of Theater, offers trap-room-to-grid guidance. Clearly written, heavily illustrated, this book covers every aspect of scenery construction. 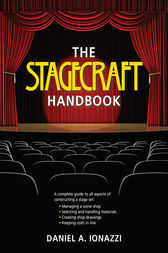 Let The Stagecraft Handbook help you turn ordinary materials into extraordinary illusions.